As a trustworthy supplier, we take pride in presenting our customers with excellent quality Tulsi Plants(basil). Since, we have a widespread supply chain network; we can satisfy buyers by catering to bulk requirements and making delivery within the stipulated time. Soils : The plant is sufficiently hardy and it can be grown on any type of soil except the ones with highly saline, alkaline or water logged conditions. However, sandy loam soil with good organic matter is considered ideal. Climate : The crop has a wide adaptability and can be grown successfully in tropical and sub-tropical climates. Long days with high temperature have been found favourable for plant growth and oil production. 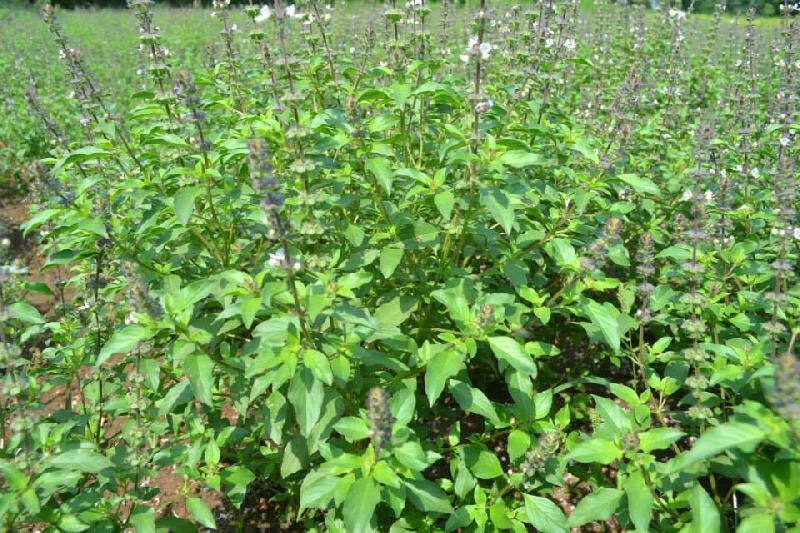 Purple type ( Krishna tulsi) are under cultivation. Propagation : The crop can be propagated either through seeds or cuttings. Nursery raising : For propagating basil through seeds, they are to be sown in the nursery beds. The nursery should be located preferably in partial shade with adequate irrigation facilities. Soil is worked upto a depth of about 30 cm. Well rotten farm yard manure (2 kg/sq.m) is applied to the soil and prepared to a fine tilth and seed beds of 4.5x1.0x0.2 m size are prepared. As the seeds are minute, the required quantity of seeds are mixed with sand in the ratio of 1:4 and sown in nursery bed, 2 months in advance of the onset of monsoon. They germinate in 8-12 days and seedlings are ready for transplanting in about 6 weeks time at 4-5 leaf stage. Vegetative propagation : Vegetatively it can be propagated by terminal cuttings with about 90-100 per cent success during October-December months. For this purpose, cuttings with 8-10 nodes and 10-15 cm length are used. They are so prepared that except for the first 2-3 pairs of leaves the rest are trimmed off. Later, they are planted in the well prepared nursery beds or polythene bags. In about 4-6 weeks time the rooting is complete and they are ready for transplanting into the mainfield. The plants are transplanted at a spacing of 40 cm between the row and 40 cm within the row. After transplanting irrigation is provided twice a week till one month so that the plants establish themselves well. Later, it is given at weekly interval depending upon the rainfall and soil moisture status. The first weeding is done one month after planting and the second after another 30 days. Afterwards, no further weeding is required as the plants become bushy and cover the soil and thereby smother the weeds. However, after each harvest, weeding should be done so as to avoid weed growth in the interspaces, if any. Spray the crop with 0.2% malathion or 0.1% methyl parathion to control leaf rollers never noticed. To control powdery mildew, spray the crop with 0.3% wettable sulphur. Drench the nursery beds with a 0.1 per cent solution of mercurial fungicide. Adopt phytosanitory measures to control the seedling blight and root rot. The crop is harvested at full bloom stage by cutting the plants at 15 cm from ground level to ensure good regeneration for further harvests. The first harvest is done after 90 days of planting and subsequently it may be harvested at every 75 days interval. Harvest the crop on bright sunny days to get good yield and oil quality. On an average, basil gives about 10,000-15,000 kgs of fresh herbage per hectare per year. As the herb contains about 0.1 to 0.23 per cent oil, commensurating to it we may obtain about 10-23 litres of essential oil per hectare. Note : FYM along with half of nitrogen and the entire of phosphorus and potassium is given as a basal dose, and the remaining nitrogen is applied in two splits after first and second cuttings.